recolectada en la zona Sur del Macizo Guamuhaya. Detalle de extremos de varios filamentos y ramificaciones. Foto: Ángel Moreira..
Ceramium diaphanum (Lightfoot) Roth recolectada en la zona Sur del Macizo Guamuhaya. Detalle de extremos de varios filamentos y ramificaciones. Foto: Ángel Moreira. Type locality: Scotland (Silva, Basson & Moe 1996: 395). Lectotype: BM-K (Maggs & Hommersand 1993: 54). Adjective (Latin), colourless and nearly or quite transparent, diaphanous (Stearn 1973). John et al. (2004) cite Ceramium elegans (J. Agardh) Ducluz., C. nodosum (Kütz.) Harv. and C. tenuissimum (Roth) J. Agardh as synonyms of this species. In view of the taxonomic change by Maggs & Hommersand (1993) Scandinavian records of this species are uncertain (Athanasiadis, 1996). Hommersand, M.H., Freshwater, D.W., Lopez-Bautista, J.M. & Fredericq, S. (2006). Proposal of the Euptiloteae Hommersand et Fredericq, trib. nov. and transfer of some southern hemisphere Ptiloteae to the Callithamnieae (Ceramiaceae, Rhodophyta). Journal of Phycology 42: 203-225. Skage, M., Gabrielsen, T.M. & Rueness, J. (2005). A molecular approach to investigate the phylogenetic basis of three widely used species groups in the red algal genus Ceramium (Ceramiales, Rhodophyta). Phycologia 44: 353-360. Wolf, M.A., Sciuto, K., Maggs, C.A., de Barros-Barreto, M.B.B., Andreoli, C. & Moro, I. (2011). 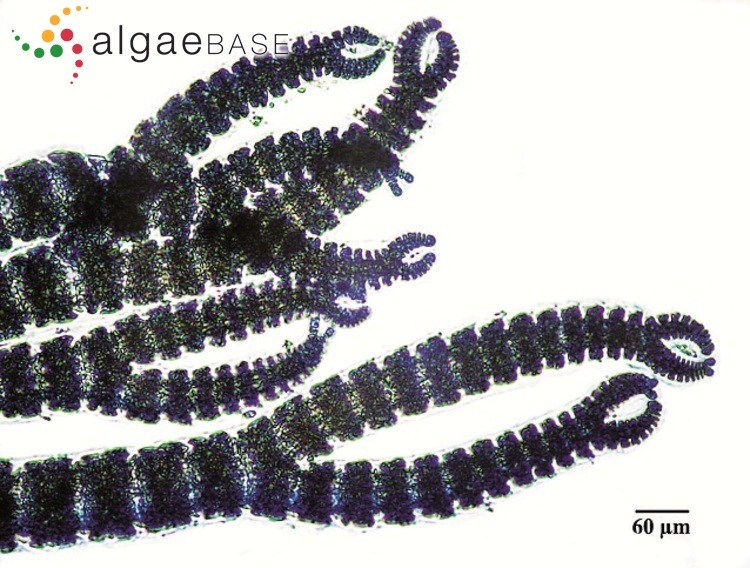 Ceramium Roth (Ceramiales, Rhodophyta) from Venice lagoon (Adriatic Sea, Italy): Comparative study of Mediterranean and Atlantic taxa. Taxon 60(6): 1584-1595. Accesses: This record has been accessed by users 9171 times since it was created. Du Rietz, G.E. (1930). Studies in the taxonomy and ecology of Ceramium diaphanum in the Baltic. Botaniska Notiser 1930: 433-458. Lucas, J.A.W. (1953). Ceramium diaphanum (Lightf.) Roth, its varieties and forms as found in the Netherlands. Acta Botanica Neerlandica 2: 316-326. Rueness, J. & Boo, S.M. (1994). Structue, reproduction and culture studies of Ceramium diaphanum (Lightfoot) Roth (Ceramiales, Rhodophyta) from Norway and the Mediterranean. Cryptogamic Botany 4: 321-328, 28 figs, 1 table.